Huawei had many LTE Cat6 routers available now but the competitor ZTE has very few Cat6 routers in the market. ZTE MF286 router is one of the ZTE LTE Cat6 routers, since Huawei B525s LTE Cat6 router, some people want to know what the difference between Huawei B525 and ZTE MF286 is. We would compare the Huawei B525s with ZTE MF286 from the appearance, interfaces, specs, and features in this blog. 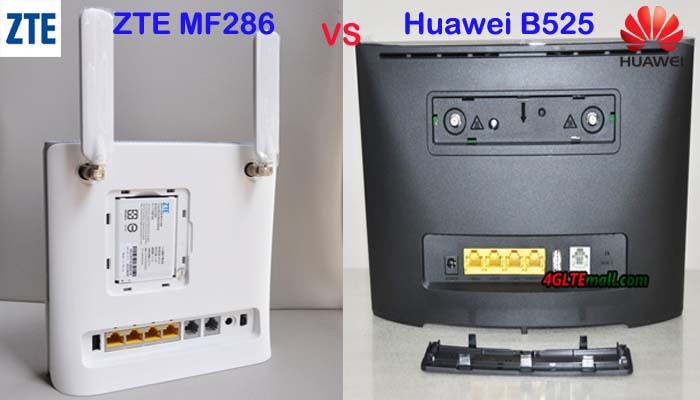 ZTE MF286 and Huawei B525s are both in the typical design of 4G WiFi router. On the front, there are some indicators for Power, WiFi, and Signal. The ZTE MF286 has also the indicators for Telephone, 3G/4G Data and Battery. Huawei B525 doesn’t have the indicator for telephone and battery. But it has the indicator for Ethernet connection. On the back, they both have 3 LAN ports and one LAN/WAN ports. 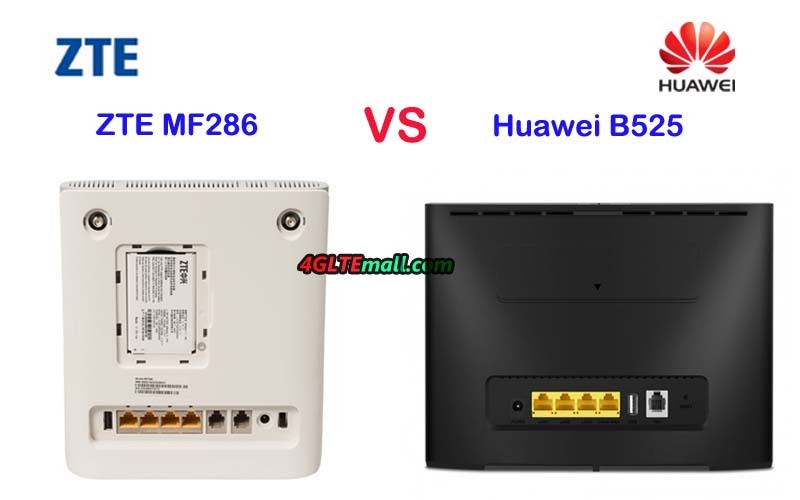 Huawei B525 has only one telephone port while ZTE MF286 has two telephone ports. They both have the power adapter plug and USB port, but the ZTE MF286 has the power on/off button. The SIM card slot of Huawei B525 is located at the bottom while the ZTE MF286 sim card slot is at the edge side. They both have two SMA connectors for external LTE antennas. The unique feature of ZTE MF286 is the removable battery which makes it work like a mobile WiFi router. Huawei B525s has the WPS and Power buttons on the top side while the ZTE MF286 has the WLAN and WPS buttons with the Reset hole on the top side. From the specs table, we can see the Huawei B525s and ZTE MF286 are both LTE Cat6 router which could achieve download speed up to 300Mbps and upload speed to 50Mbps. The Huawei B525 router has two variant models now but ZTE MF286 has only one variant model. They both support maximum up to 64 wireless devices but ZTE MF286 supports 3 X 3 MIMO while Huawei B525 supports 2 X 2 MIMO. The removable battery adds many bonuses for ZTE MF286 router because it can make the MF286 router used as a mobile WiFi router. Then the ZTE MF286 could be used in much more circumstances. With the similar technical feature, ZTE MF286 price is cheaper than Huawei B525 price. Perhaps because the Huawei B525 is the latest router and ZTE MF286 is an old model. 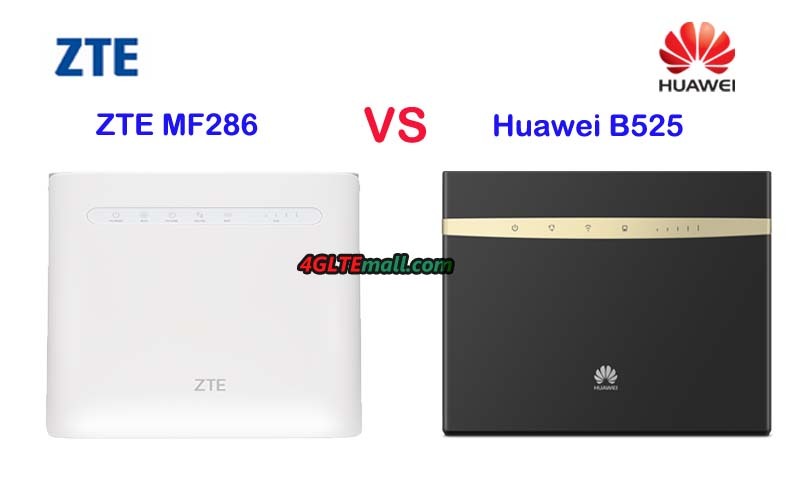 We didn’t take the speed test for Huawei B525 and ZTE MF286, but from the specs, we think the ZTE MF286 is better than Huawei B525 Router.